The much anticipated sequel to Madagascar is finally here! Check me out at the red (or green, rather) carpet premiere of Madagascar 2 with Black Tree Media. Attendees included Ben Stiller, Chris Rock, Jada Pinkett-Smith, David Schwimmer, Cedric The Entertainer, Andy Richter, Sherri Shepherd, will.i.am, Tom McGrath and Eric Darnell (Directors), Etan Cohen (Screenwriter), Mireille Soria (Producer), Mark Swift (Producer), and Hans Zimmer (Composer), just to name a few. 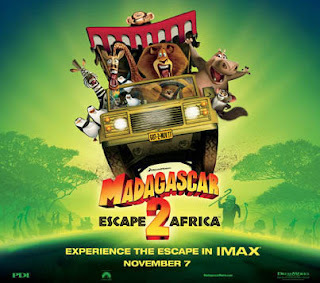 Madagascar 2 is in theaters and IMAX tomorrow, Friday, November 7th. Click the title link for more info or to purchase tickets. super cool!! get it Girlll. I'm loving all of the differnt directions that this Blog takes. Keep exploring new and interesting places. Also, Kan great interviews!